The problem with American schools is soup. Our students are stunted in their education by Chef Boyardee, Campbell's Soups, and Kraft macaroni and cheese. There's only so much teachers can do when we are up against the dumbed-down microwave pasta powerhouses. Thanks to a student who calls Roman numerals, "Ramen noodles" this solution became clear to me. We need macaroni that teaches! 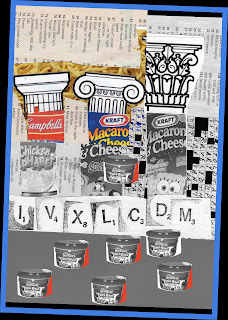 We need Campbells vegetable soup with Roman numerals instead of ABCs and 123s. We need Kraft mac and cheese with Greek columns instead of Scooby Doo and Sponge Bob.